What are the primary reasons we need to depart from capitalism? What about innovation, wealth production, liberty, etc.? Doesn’t capitalism create these aspects of civil society? What about entrepreneurship and “American exceptionalism? What are the foundations of capitalism? All around the world, something long overdue has been gaining momentum: a deepening sense that our current form of feudalistic state capitalism is frighteningly destructive, and that we urgently need to move beyond it. This awareness has been present since the onset of industrialized society, mainly among marginalized and exploited communities, but also among those who have taken time to appreciate the historic narrative of those oppressed populations. Unfortunately, until fairly recently, the rapid enrichment of a middle class in the industrialized world, and the effective distancing of abuse and impoverishment onto developing countries, has successfully insulated even the well-educated from consequences of commercialist corporationism. But with increasingly fluid global trade – and the equally fluid explosion of Internet information and democratization of personal digital communication – the cultural segregation of haves and have-nots has eroded, incontrovertibly exposing the ugly underbelly of the profit motive. For the first time in capitalism’s history, we can learn about government corruption, cronyism, industrial accidents, corporate malfeasance and mismanagement, market failures, product hazards, callous acts of the upper class, overreach of our security apparatus, abuses of police and so much more within mere moments of an uploaded news article, a whistleblower leak, a research paper or a cell phone video. The reflexive ideological spin from all points of the spectrum may still be endless, but cat is already out of the bag. 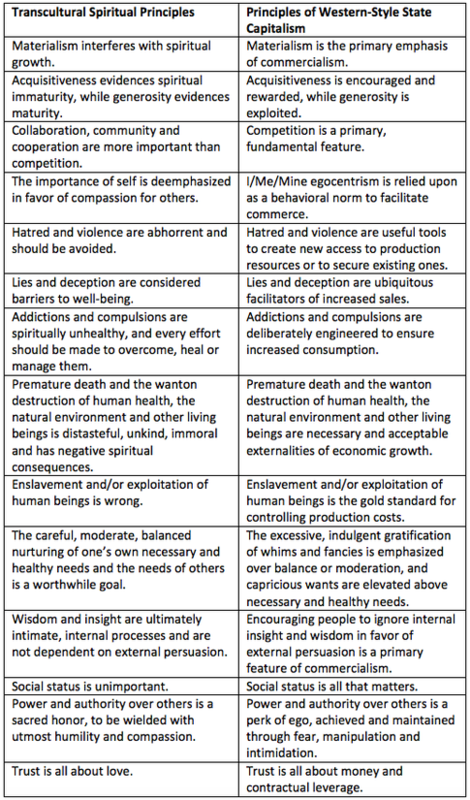 The causal foundations of the capitalist problem have been identified at many times and in many ways, but really they all point to the same thing: the rewarding, enabling and indeed elevation of the most base and destructive of human impulses above our more prosocial, empathetic and mutually compassionate ones, with consistently devastating results. Whenever there are extreme concentrations and inequitable divisions of wealth and power – which are, unarguably, the most prolific and enduring consequences of state capitalism and commercialist corporationism – all other values tend to be subjugated to that matrix, if they aren’t discarded entirely. There are so many examples of this, but let’s explore a few of the more potent reminders. How does the enslavement of millions of workers around the globe promote the value of liberty? Proponents of capitalism have claimed for years that sweatshops, abusive labor practices and the like are economic opportunities for the desperately poor, and therefore should be lauded rather than criticized (see Robert Tracinski’s writings on the topic for an example of this). And of course this lauding is a lie, for just as share cropping was no different than slavery, and the truck system was no different than slavery, the current exploitative labor environments in the developing world are just as hostile and lethal as a forced labor camp. The many exposés of the 1990s on Central America’s maquiladoras brought this into broad public awareness, but even as worker conditions marginally improved there, the abuses just migrated to other countries. As recently as the 2012 Dhaka garment factory fire and the Savar building collapse a year later, we continue to have potent reminders of modern abuse and implicit enslavement of human beings in service of a free market. And an only slightly different manifestation of the same trend is the growing problem of human trafficking. According to the ILO Global Estimate of Forced Labour. Results and Methodology 2012 there were 29.9 million victims of forced labor around the world, 90% of which were in the private economy, 68% of which were victims of forced labor, and 22% of which were employed in forced sexual exploitation. The ILO indicates human trafficking to be in third place for illegal business – after drug dealing and arms trading. Such exploitation has always been a consequence of elevating the profit motive above other, more humanistic values, and has been a blatant component of capitalist enterprise at one time or another just about everywhere on Earth. How does the monopolization of whole industries by megaconglomerates aid innovation, beneficial competition or consumer choice? For this is another indisputable outcome of commercialist corporationism. Despite antitrust laws, innovative startups, and the initial perception of consumer choice in emerging industries, the inevitable outcome in all longstanding arenas of production is a handful of huge companies that dominate all others. And even among those companies, we see that substantive differentiation in quality, durability or features is an illusion, because all the of the components of competing products actually end up being produced in the same handful of factories. And even when innovation does occur in some outsider startup (from innovation that is frequently the result of government research or funding - not the private sector), it is almost always just a matter of time before the outsider founders either sell the company to one of the existing monopolies, the startup is acquired by a monopoly in a hostile takeover, or the startup itself begins to accumulate competing companies. Will Tesla, for example, still be an independent car manufacturer ten years from now, or will it somehow become entangled with one or more of the auto industry behemoths? If history is any guide, the prospect of independence is doubtful. So in everything from food production to electronics to telecom companies to banks, consumer choices become fewer and fewer with each passing decade, until really there is often only one option, all previous illusions of “voting with your dollars” completely evaporate, and innovations that challenge existing monopolies are squashed before they ever make it to market. How do crony capitalism, regulatory capture and a revolving door between industry and government leadership support representative democracies? Well of course they don’t at all. The only values or agendas that get represented when revolving doors, regulatory capture and cronyism are in play are those of the cronies themselves; the more diverse interests of the electorate – indeed even the majority interests – will be ignored if they do not coincide with corporate interests. Crony capitalism is actually disparaged across a broad ideological spectrum, because it interferes as much with free market competition as it does with democratic governance. Yet despite this collective disdain, essential bulwarks against cronyism, such as campaign finance reform, have either failed to move forward or been rolled backward by decisions like Citizens United. Most recently even someone like Barack Obama, who campaigned on a platform of “sweeping ethics reform” regarding the undue influence of money in politics, have still succumbed to the age-old practice of appointing major fundraisers, corporate lobbyists and industry insiders to government positions, where those appointees continue to promote the same pro-capitalist agendas that they did in the private sector. There was perhaps no more glaring example of this than appointing Tom Wheeler - a former lobbyist for the communications industry - to Chair the FCC. How do perverse incentives improve our quality of life? This issue has a particularly personal resonance for me. In U.S. healthcare, there is very little incentive to help people maintain healthy lifestyles or treat the underlying causes of their maladies. Why? Because doctors in the U.S. don’t get paid for keeping their patients healthy, they get paid for procedures they perform, and the more complex the procedure – or the more they perform – the more they get paid, regardless of whether the procedures address the causes of ill health. Along the same lines, pharmaceutical companies make most of their money medicating away symptoms with drugs that are continuously administered, rather than from drugs that heal or eradicate illness. Consider that the most expensive equipment (i.e. capital items) in any hospital are not rehabilitation equipment, or surgical equipment, or any sort of treatment equipment, but diagnostic equipment – that is, equipment that makes the most money for the hospital because it is used the most frequently to justify additional, often expensive procedures and treatments. What if the same level of research, development and investment was made in preventative medicine? Wouldn’t that provide a better health outcome for everyone? Well of course it would, but it wouldn’t provide the same amount of profit for insurance companies, hospitals, doctors, biotech and pharmaceutical companies, or anyone else in the medical food chain. This is a particularly pernicious example of how perverse incentives manifest, but they evidence themselves everywhere – in executive bonuses calculated on inflated short-term earnings, in the blackened hearts of hedge fund managers profiting from market distortions they facilitate, and so on. And of course this isn’t restricted to for-profit enterprise, as government policies have created similar mistakes – for example, Appalachian parents pulling their kids out of literacy classes for fear of losing their monthly disability checks. In all of these cases, however, the same immature impetus – an individual or collective desire for profit – is the root of the problem; it doesn’t matter that a system’s poor design allows it to be exploited, it matters that the exploitation is driven by a common motivation. These are some questions that dominate the discussion of modern capitalism. To expand on this topic, here are some of the pitfalls of modern capitalism discussed in Political Economy and the Unitive Principle…. The irreversible destruction of irreplaceable individual species and entire ecosystems on planet Earth. Among other equally tragic things, this results in a loss of biological diversity and interdependence that developed over billions of years, which in turn undermines the stability of Earth's biosphere as a whole, and of course the quality of human existence as well. Whether via pesticides and industrial pollution, or the unrelenting decimation of natural habitat for agriculture and housing, or industry-induced climate change, or the devastating damage wrought by wars over resources, or the reckless consumption of water and wild animals...privatization and trade have consistently led to widespread ecological destruction. The depletion of nonrenewable natural resources that not only have added much value to human civilization in the past, but could prove to be a dangerous deficit for future generations once they are fully depleted. An increasing homogenization and commoditization of culture that facilitates ubiquitous distribution of equally homogenous goods. This enables global economies of scale and a corresponding amplification of profit in everything from production and distribution to service and other secondary markets, but it also depletes humanity of a cultural diversity that has proven essential to human survival over time. The resulting intellectual, creative and cultural poverty-of-mind is in many ways just as threatening to our future survival as the depletion of nonrenewable natural resources. Along the same lines, there is also an inevitable decline, stagnation and disinvestment in any area of culture, science, technology, innovation, research, education, infrastructure and so on that does not lend itself to immediate, short-term commercial advantage – even though for-profit enterprise may ultimately be reliant on those supportive structures over the long term. Thus academic research and fundamental science are defunded, arts and humanities education evaporates, the transportation system and electrical grid become increasingly strained and unreliable, and diversified or creative thinking that has no clear competitive benefit is marginalized or repressed. A deliberate conditioning of consumption habits that create lifelong dependencies and interrupt healthy self-nourishment. I have called this "externalization," which is simply the incorrect and disempowering assumption that all paths leading to physical, emotional, spiritual and intellectual nourishment (i.e. happiness, love, satiation, contentment, safety, success, belonging, purpose, etc.) are dependent on the consumption of goods and services provided by other people. This estrangement from the wealth of internal, self-sufficient resources available to every human being contributes to the povertization of individuals and cultures, and to an increasing number of health problems among commercialized populations. These include: chronic depression; obesity and Type II Diabetes; addictions to nicotine, alcohol, caffeine and various prescription drugs; ADHD and other childhood developmental deficits; anxiety and stress disorders; carpel tunnel syndrome; cancer; various patterns of compulsive, excessive consumption; and of course long dark nights of the soul. Many of these consequences are now considered epidemics in America. The exaggeration of hierarchical class divisions between people around the globe, where the lowest class, which is brutally and mercilessly exploited by all other classes, makes up ninety per cent or more of the population, and the most elevated classes, which receive ninety percent of the benefit of all production, make up less than ten percent of the population. Not only is this exploitation morally reprehensible, it also inevitably leads to deep antagonisms and conflict between the classes, which has already resulted in violent revolutions, ongoing terrorism and the intermittent threat of full scale war. The endangerment of all inhabitants of Earth through the constant striving of nation states to gain the upper economic hand using (or threatening to use) increasingly lethal and widely proliferated weapons of mass destruction. The demonstrated tendency for severe swings in economic stability as the result of excessive risk taking, deceptive efforts to manipulate trade mechanisms for greater profit, ignorance of externalities, monopolization, and of course the lack of regulatory controls to reign in such behaviors. These lead to inevitable market inefficiencies and failures. Extreme concentrations of wealth and influence in corporations, which in turn undermine democracy through clientism and cronyism. In the U.S., corporations write legislation that favors their industry and then fund the elections of politicians who vote that legislation into law. Corporations also aggressively fund political propaganda campaigns that misinform voters about legislation or politicians that do not favor corporate agendas. And, as a final blow to any hope of reversing these trends, corporations have also secured constitutional protections under a fiction of "corporate personhood," which they themselves legally engineered. These and other trends illustrate a continuous erosion of political, economic and democratic freedom and power - on a global scale - for all but a tiny minority of plutocrats. As a more subtle but pervasive consequence of U.S.-style capitalism, the constant growth and expansion pressures inherent to that system have created excessively rapid pacing in the development, production and distribution of new technologies. This has accelerated changes in human habits, interactions and society to such a degree that our ability to adapt vacillates between high levels of stress as we attempt to comply with change, to an irrational backlash of rejecting change because it is happening too fast. Neither of these polarities is constructive or supportive to human mental, emotional, physical or indeed spiritual faculties. In terms of moral creativity and function, market-centric capitalism inevitably constrains morality to its lowest common denominators. For example, acquisitiveness is preferable to generosity; deception is honored above honesty; hostile competition is rewarded more than cooperative kindness; callous disregard for others is valued more than compassion or empathy; and so on. These outcomes are well-documented, longstanding and indisputable impacts of U.S.-style capitalism, and have manifested in almost every culture where this particular feudalistic memeplex has taken root. In addition, a perfect storm of destruction has manifested where three key influences intersect: first, growth-dependent capitalist economies drive accelerated innovation, production volume and resource utilization that far exceed the ability of individuals and society to adapt or the Earth's natural systems to sustain; second, the obsession with increased, short-term profits, combined with consumer addictions to newer, cheaper, sooner and more, have undermined quality, durability, reliability and safety in nearly all products and services to a devastating degree; and third, technological complexity is growing exponentially, far exceeding human capacities to manage interactions, predict outcomes or measure externalities. 4. Private property in an exchange economy produces freedom. This is ridiculous. Private property restricts freedom – 99% of everything around us is privately owned and we can’t use it, access it - or sometimes even touch it. That’s not freedom, it’s a world of fences that corral us into the few remaining spaces that are still publicly owned (or the spaces we ourselves privately own). Exchange economies likewise benefit those with the most resources and influence who can game the system for their own benefit, deceiving both consumers and workers into believing that “working and consuming” is what life is all about. But being a wage slave is not freedom. Having Type II Diabetes from eating fast food is not freedom. Becoming addicted to cigarettes is not freedom. Premature disease and death from industrial pollutants is not freedom. Having lots of cool stuff we can buy on the Internet may feel like freedom…but it’s just a poor substitute for the real thing. We are surrounded by private property and property use restrictions that impede our freedom, and impede it a great deal. And when we apply the same awareness to intellectual property, we realize how constrained all of us are in our actual application and expression of ideas, inventions and so on. Thus private property actually significantly undermines individual and collective liberty (for more on this topic see integral liberty). 7. “Free markets” exist as organically arising phenomena. They don't. All large scale economies are a product of government regulation and adherence (both voluntary and involuntary) to the rule of law regarding trade. The State has what can only be described as a socialist role in all of the world's largest and most successful economies, which is why the current landscape is often described as "State capitalism," or, perhaps most accurately, a "Mixed economy." For example, such economies rely upon the infrastructure, technology, research, monetary system and regulatory framework provided by the State. 8. Economic growth in a capitalist system is perpetual and unlimited. We live in a closed system, with limited natural resources that will eventually be depleted. As standards of living (inclusive of political and social liberalization) rise in developing countries, cheap or malleable labor also becomes less and less available. The U.S. standard of living, although often held up as a gold standard and clear evidence of U.S. exceptionalism, is completely dependent on abundant natural resources and cheap labor. It is simply not possible for everyone on Earth to live an American lifestyle, where per capita consumption is 50x what it is for someone in a developing country. To assume this is sustainable or universally accessible is akin to believing the irrational math of multilevel marketing schemes. This is one reason why U.S. real wages have either remained flat or declined since about 1972. 9. ”Rational self-interest" determines economic outcomes in capitalism. This one of the more egregious misconceptions, grounded in ideological fervor but profoundly lacking in empirical evidence. Economic outcomes in modern capitalism are mainly the result of the calculated exploitation of workers and natural resources, careful deceptive manipulation of consumers, activist cronyism and clientism in government, and the hoarding of control over the means of production by a tiny, self-serving plutocratic elite. Even when evaluating microeconomic motivations and purchasing patterns, behavioral economists have clear evidence that human beings make irrational, inconsistent, often contradictory decisions about purchases and economic priorities. When we look at where many of our most important innovations and successful technologies have originated, it rapidly becomes clear that the profit motive isn’t particularly critical in generating new ideas - and certainly not for funding them. A particularly potent example of this is Elon Musk, a vociferous proponent of American Exceptionalism, who has funded all of his most well-known technology innovations and “successful businesses” with money from the U.S. taxpayer. And as of this writing (October, 2016), none of Musk’s taxpayer-funded enterprises (Tesla, SpaceX, Solar City) have actually made a self-sustaining profit independent of government subsidies. Musk has, however, maintained an inspiring illusion of success while certainly profiting personally a great deal from his ventures - but the lion’s share of risk has been socialized. For more on this topic, consider reading this blog post: What Has Elon Musk Failed At? It is a slightly different case in terms of real-world implementations, improvements over time, and mass adoption by the public. This is where marketing, advertising, consumerism and acquisitiveness seem to have been quite helpful - except, of course, for the negative externalities such surges in demand ultimately induce. That is, until monopolization occurs, and innovation is aggressively squelched in favor of lower-risk options with proven profitability. But I do think it is obvious that friendly competition is important - even for public goods. 5. An ever-increasing concentration of wealth and power in the hands of those who control the means of production - and an impoverishing and depletion of everyone and everything else - in order to ensure that 1–4 above remain intact. Now supporting these five pillars of capitalism is the straightforward “vile maxim” coined by Adam Smith: “All for ourselves and nothing for other people.” It is a philosophy of pernicious solipsism, thriving on materialism and individualism in their most extreme manifestations. This disposition is not, as the neoliberal camp, anarcho-capitalists and Ayn Rand fans would have us believe, the bedrock of human nature. In fact most evolutionary biologists have documented a much more dominant theme of prosociality in both human and animal behavior. But the vile maxim makes for very good self-justification and propaganda for enabling the five pillars of capitalism. Once we recognize what capitalism relies upon to function - and the fundamentally mistaken philosophical stance that drives it - we can effectively undress the myths that encourage the de facto oppression and destruction of workers, consumers, civil society and the environment. I am referring of course to the clear antagonisms that organized labor, consumer advocacy, civil rights, democracy and environmental regulations present to crony capitalism. These pesky trends are extremely irritating to corporatocracy, and are therefore constantly under attack by the plutocratic elite, who have - in the U.S. and much of the rest of the world - successfully arrested and in many cases reversed the progressive advances of the last century that have ensured these protections. In any case, gaining awareness around these dynamics - and educating others about them - is a critical first step in moving away from capitalism. Yanis Varoufakis said in his article “How I became an erratic Marxist"
These (and many other examples, if I had time to write them all) are why capitalism in its current manifestation can never become more spiritual, and why spirituality is always, without exception, corrupted by capitalism. Regarding many of the destructive consequences of capitalism, the data is already in. Climate change influenced by human industry is real and will have devastating consequences within our lifetime. Species extinction as a result of pollution, hunting and commercial habitat destruction is accelerating, and we will likely see some 60% of the genetic diversity of Earth vanish within then next few decades. Apart from the increases in mental illness and lifestyle-induced diseases like Type II diabetes, there is strong evidence that stress-induced phenotypes that negatively impact our mental and physical health can be passed on to subsequent generations. The ongoing and highly volatile boom-bust cycles of growth-dependent capitalism are well-documented and have increasing global impact. And of course the exploitation of labor - in the form of sweat shops, child labor and prison labor in the developing world, as wage and debt slavery in the U.S., and as human trafficking almost everywhere - is ceaselessly creative in its manifestations. And, sadly, all of these downward spirals have been predicted for a very long time - they have just been scoffed at and ridiculed by plutocrats who fear their cookie jar would be taken away. In fact, we can reliably say that whenever pro-capitalist conservatives become agitated enough to initiate propaganda campaigns against any scientific assertions or common-sense solutions, we can be sure the underlying problems are real and need to be addressed. Conservative pushback is the real canary in the coal mine here. This was intimated by the “Red Scares” after WWI and WWII, by the doom and gloom predictions about everything from women’s suffrage to child labor laws to consumer and worker protections to the minimum wage, and of course by the “global warming hoax” of the last decade. There is an excellent example of the mindset behind these objections in a memo written by Lewis F. Powell, Jr. in 1971 regarding the “Attack of American Free Enterprise System,” which is clearly energized by the mistaken belief that capitalism equates freedom. It was this memo that purportedly led to the creation of many now longstanding engines of propaganda against anything that threatens profitable destruction or corporate power (Heritage Foundation, Cato Institute, etc.). In this sense, the election of Donald Trump to be POTUS is a clarion call for assertive Level 7 action, and is potentially one of the final nails in the Earth's economic, environmental, cultural and political coffin. What Does the Billionaire Family Backing Trump Really Want?